Price volatility in Brent crude brought levels below $100 per barrel in recent weeks. This sparked concerns among some OPEC members that current production levels are too high, and that output needs to be cut in order to maintain ‘acceptable’ price levels, said Gibson Research in the broker’s weekly report. Despite the recent move back above $100 per barrel, concerns are often raised from the so-called ‘hawk members’, who rely heavily on price strength to sustain oil revenues. However, Saudi Arabia’s Oil Minister Ali Al-Naimi viewed current prices as “reasonable” (balancing concerns about global economic growth with national oil revenues). Should oil prices fall further, Saudi Arabia holds a significant leverage of supply to reduce crude availabilities and drive a price rally, as we have seen during the first few months of this year, Gibson said. OPEC may have to address the problem of rising Iraqi production at a time of no demand growth to see out the extra barrels. IEA estimates said that Iraqi crude production was around 2.96 million barrels per day in March, with the expectation that this will rise to between 3.3-3.5 mill barrels per day on average this year. The fast-growing oil exporter is undercutting Saudi Arabia by selling its crude cheaper to grab a bigger slice of the Asian market, but the sharp price cuts from both parties suggests the market share is going to remain competitive. One positive result seen recently from the falling oil prices was the reduced bunker costs. Bunker prices have been falling steadily since the start of April; Rotterdam 3.5% sulphur bunker prices have dropped by $29 per tonne over the period, to average $575 per tonne last week. 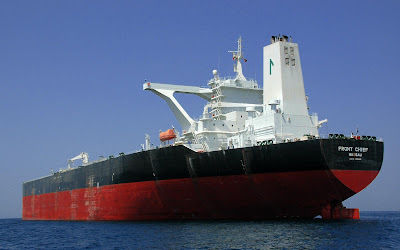 However, if prices fall too far there is always a double-edge sword scenario when OPEC cuts production, thereby reducing crude tanker demand and raising bunker prices, Gibson said. VLCCs shipping crude out of the AG to Asia (TD3) are being fixed at a rate of a round WS30, having remained at similar stagnant figures throughout April. Our estimates for equivalent earnings are around $6,000 per day, not even enough to cover fixed operational costs of around $10,750 per day, Gibson said. There is no wonder why whispers of lay-up are growing louder, the broker said. For now, it can be assumed that subdued Asian demand for crude is temporary and heavy refinery maintenance in the East, which is expected to be restarted in May/June should bring owners out of the dark; but it is still OPEC (including Iraq) and its responses to prevailing oil prices that will have a major impact on the crude tanker market, the report concluded.